Then, it took me all of another five minutes to go to the Google eBookstore and find and pay for Life, On the Line, a book about a chef who lost his sense of taste. I have been longing to read this book since hearing the author, Grant Achatz, interviewed on NPR’s Fresh Air program last March. Thanks to new technology, in just minutes I am now able to do what might have taken months, if not years. I can now find, purchase and “read” books online just like anyone else who has 100% vision. All of this is made possible by VoiceOver, the iPhone’s built-in text-to-speech screenreader and navigation program, as well as the accessibility of Google Books and its app. Both have combined to truly revolutionize my life since I lost my ability to read regular print books more than 30 years ago. Before the iPhone and Google Books, there were other reading options available to people who are blind and visually impaired.. The National Library Service (NLS) for the Blind and Physically Handicapped, a branch of the Library of Congress, records and makes books and magazines available for downloading or borrowing. The recordings are wonderful, and the NLS’s proprietary book playback equipment is free. I currently have 12 NLS recorded books and two magazines that I read on my own digital book reader, the Victor Reader Stream, which is smaller and more portable than the NLS machine. While I love the NLS and its Braille and Recorded Digital Download site, I hate the sometimes excruciatingly long wait before the NLS gets around to recording and converting the books I actually want to read. Sometimes it takes two or three years; sometimes a book I want to read never makes it onto the NLS librarians’ radar screens. Another option for blind people, which I also love, is BookShare, which scans books and magazines and newspapers, converts them to braille and DAISY-formatted files, and makes them available to registered members (whose reading disabilities have been verified) for downloading and playback on a number of devices, including my BrailleSense OnHand notetaker, which has a refreshable braille display, and my Victor Reader Stream digital book reader. I’m still waiting for BookShare’s team of volunteers to make some of the books on my wish list available, but I know they’ll get to it sooner or later. BookShare provides a wonderful service, and I appreciate all that they do for me and others who cannot read standard print independently. I’m also lucky because I’m able to have access to so much assistive technology, which is expensive. In addition to my digital book reader and notetaker, I also own a scanner that’s hooked up to my computer, and Kurzweil software that allows me to scan and convert many print books into digital format, which I can then access as MP3 audio files. Then of course there’s my new iPhone. The coolest thing is the immediacy with which I can read any book I can purchase (or download for free if it’s in the public domain) from the Google ebookstore. Apple and Google has eliminated the long wait, which, for me, was the most frustrating part of downloading and reading books. I don’t own a Kindle. Yes, Amazon finally added an accessible menu to its e-reader a couple of years ago, and there’s even a Kindle application — but it runs only on a PC. There’s a Kindle app for the IPhone, but because of publishers’ insistence, it does not work with VoiceOver. If I want to use a Kindle app to “read” a Kindle book, I have to sit in front of my computer and use the Amazon Kindle text-to-speech engine, which reads the book aloud. It turns out that not only do I not want to wait for a book, I also do not want to be tied to my computer, either. I want to sit in my big EZ Chair — like many others do — and relax with my book. Perhaps with a drink on the end-table beside the chair and my feet propped on the footstool in front of me! I want to thank Apple, I want to thank Google, and I want to applaud their impulse to cooperate. They haven’t always been the best of friends — Republicans and Democrats might want to take note — but they make a great team for accessibility. Now, I have to get back to my book! 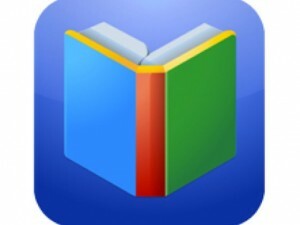 The biggest problem I have with the Google Book app and VoiceOver is that the app does not turn the pages automatically like it happens in the iBooks app. Since VoiceOver is an important tool for the visually impaired, turning the pages automatically should be an option. Sometimes it takes several attempts at the flicking of three fingers before the page will turn and then it will do just a paragraph unless we can hurriedly flick two fingers down so that the complete page will be read.